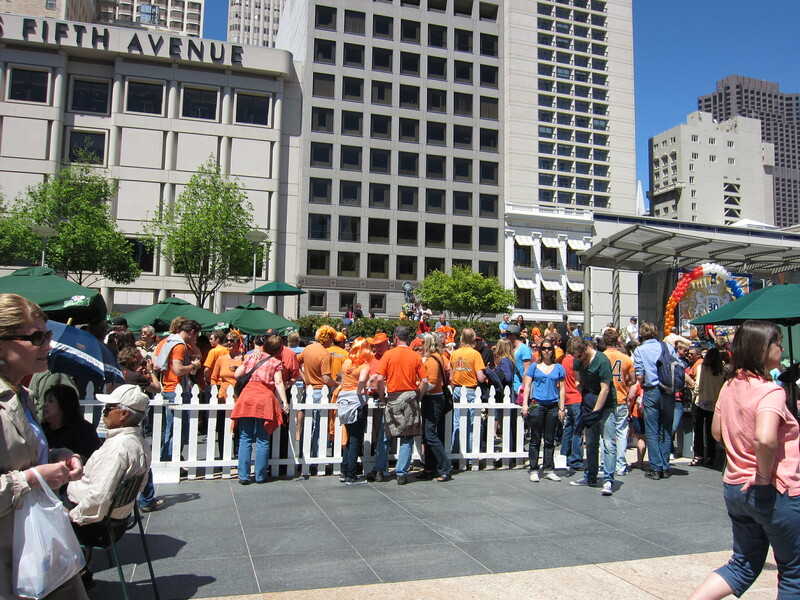 Nothing compares to being in Amsterdam for Queen’s Day but the small Queen’s Day celebration here in San Francisco organized by the Netherlands Consulate was pretty impressive. 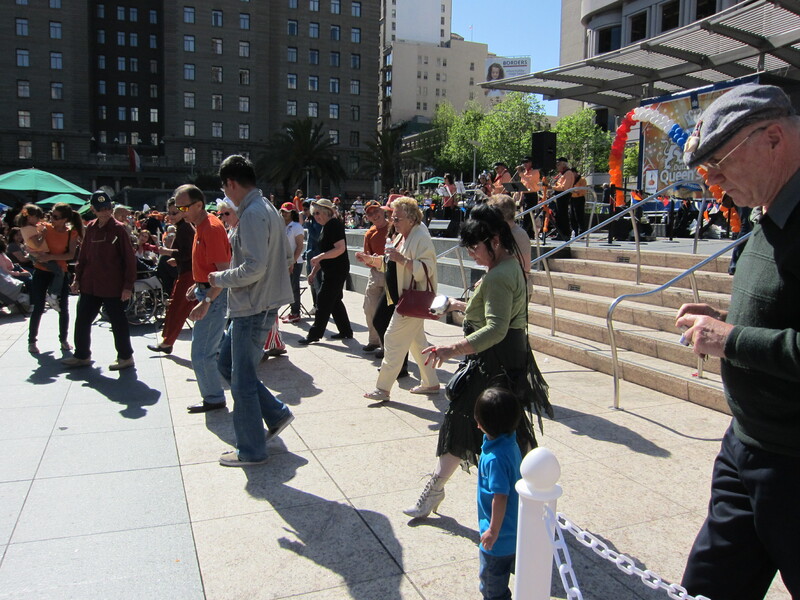 The celebration’s itinerary included a bike ride from the windmill in Golden Gate Park in the morning, a festival in Union Square in the afternoon and then a party in Azul Lounge later in the night. At a time when all we hear about is how broke the United States is and how we can’t even depend on our government for health care and social services, it’s pretty humbling to see that a small country like the Netherlands not only takes care of its citizens but even organizes events in other countries to make sure that their countrymen stay connected to their culture and, most importantly, have fun! 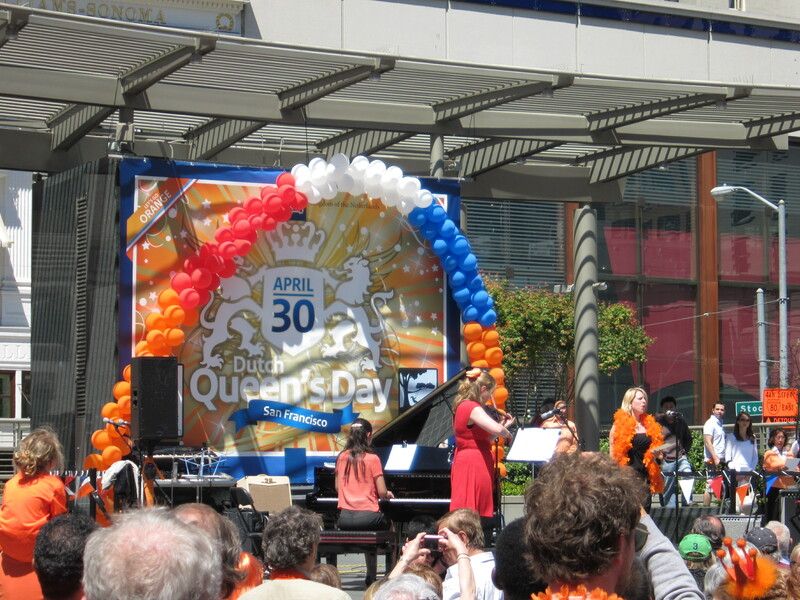 Queen’s Day happens every April 30. It’s the day when the entire country celebrates its royal family. The tradition of having a big party on behalf of its queen started with the birthday of Queen Wilhelmina on August 31, continued with Queen Juliana on April 30 and stays alive today with Queen Beatrix, whose own birthday is actually on January 31 but wisely decided to keep Queen’s Day on April 30 so that her citizens wouldn’t have their freeze their asses off. 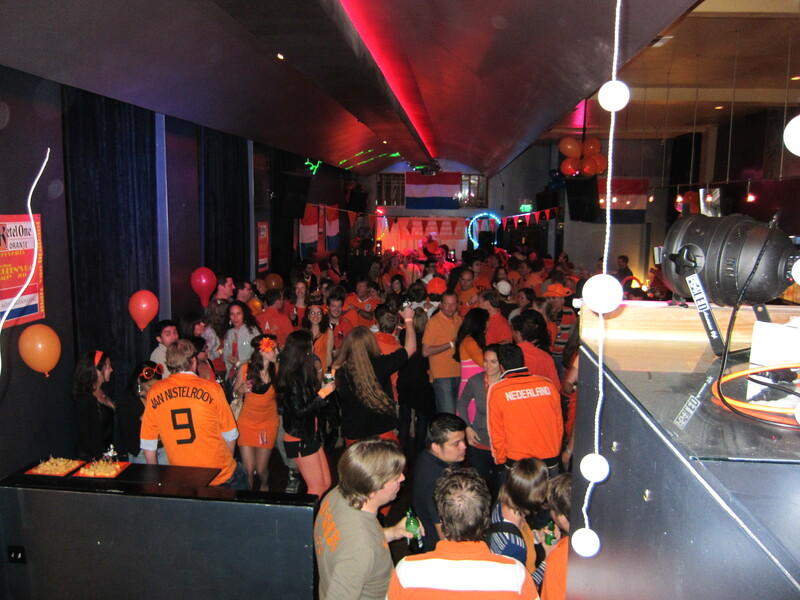 Queen’s Day in Amsterdam can usually be characterized as a giant street party, complete with headache-inducing electronic music, canals filled with party boats and drunken tourists and Dutch people everywhere. It’s quieter and more of a family affair in the smaller cities and towns. 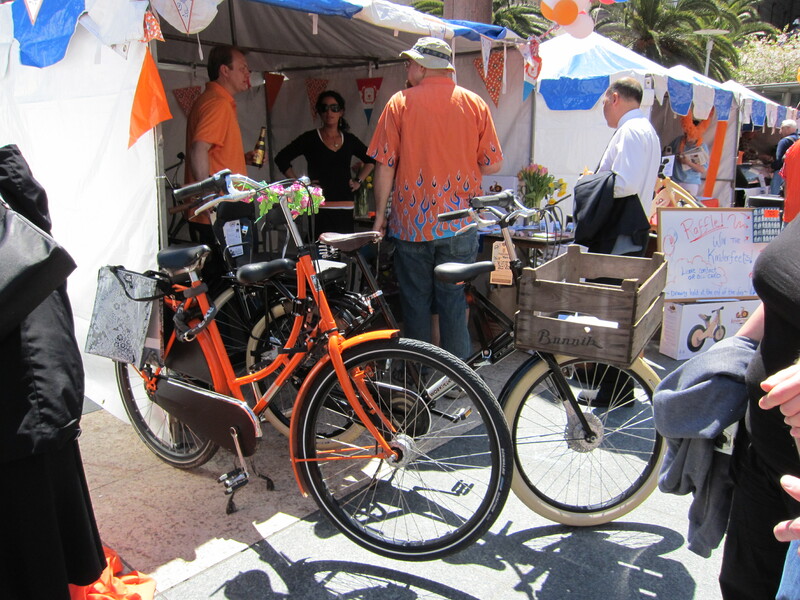 Queen’s Day is also when the Dutch can indulge in their passion of finding cheap things. People dump their unwanted goods on the street for sale without the need of a permit and taxes. 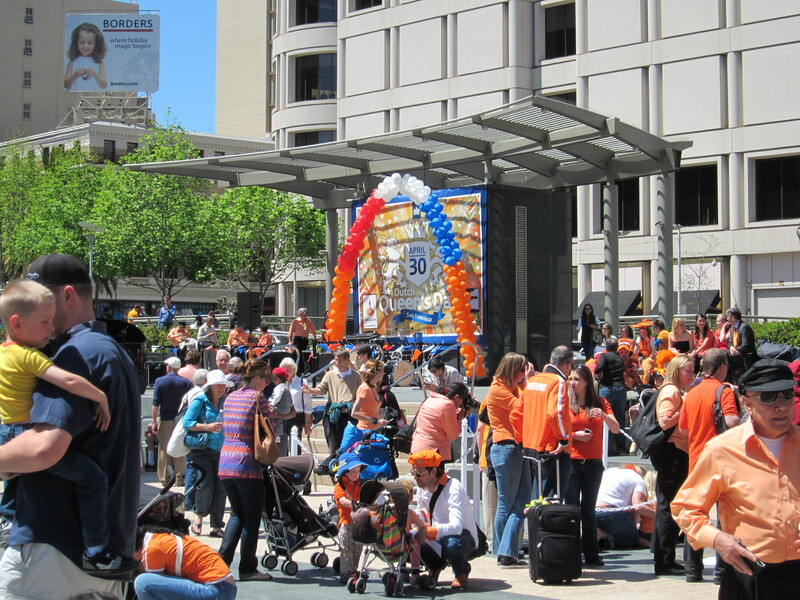 The consulate took over Union Square for the festival, which as you can see was well attended with lots of people in orange. There was music, a children’s play area, a beer garden (otherwise known as the cattle pen by Hubby) and stalls advertising various things. 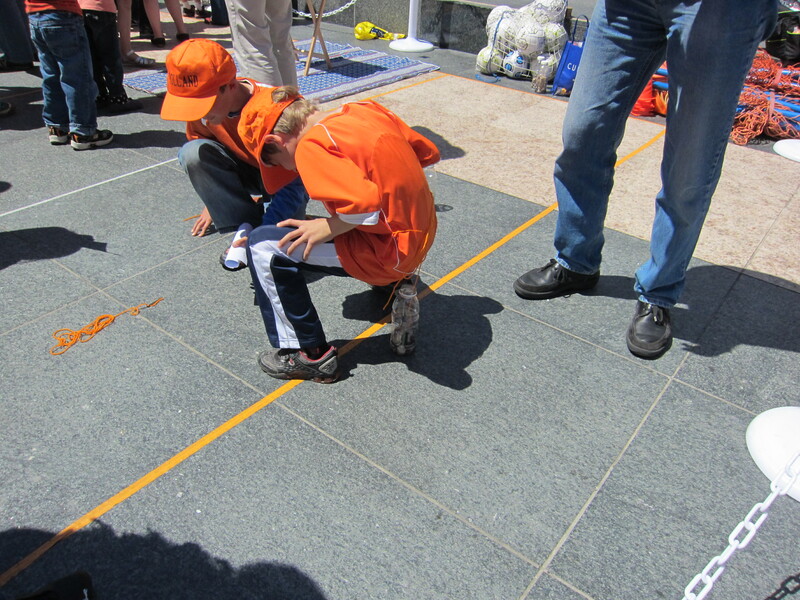 If you’re wondering what the little boys above were doing, they were playing spijkerpoepen, which literally translates as “nail pooping.” The kid has a rope tied around his waist with a nail hanging off a string in the back. You win if you get the nail in the bottle. Not only do the Dutch have weird toilets, they also have a game mimicking a bodily function that others usually try to hide. 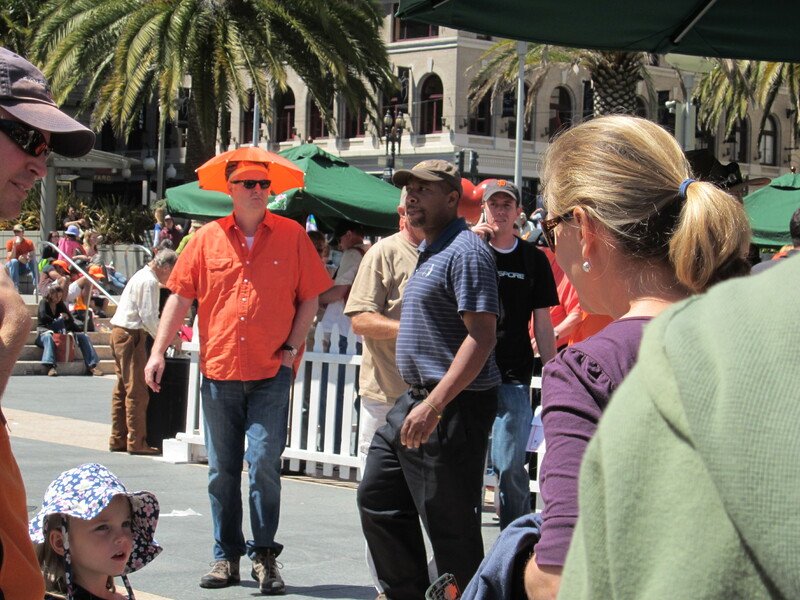 I like the man’s orange umbrella hat. You get to look like a tree and protect your skin at the same time. Brilliant! 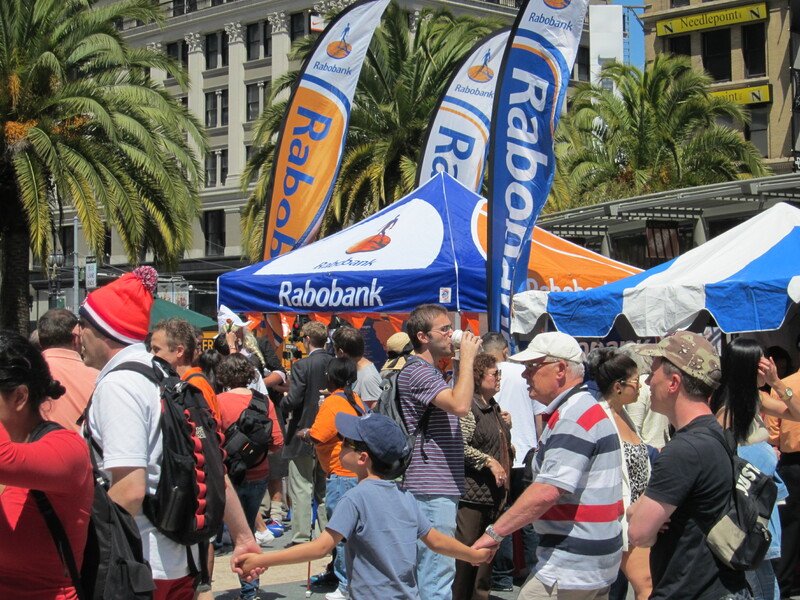 The only thing that was missing at the festival was more food. 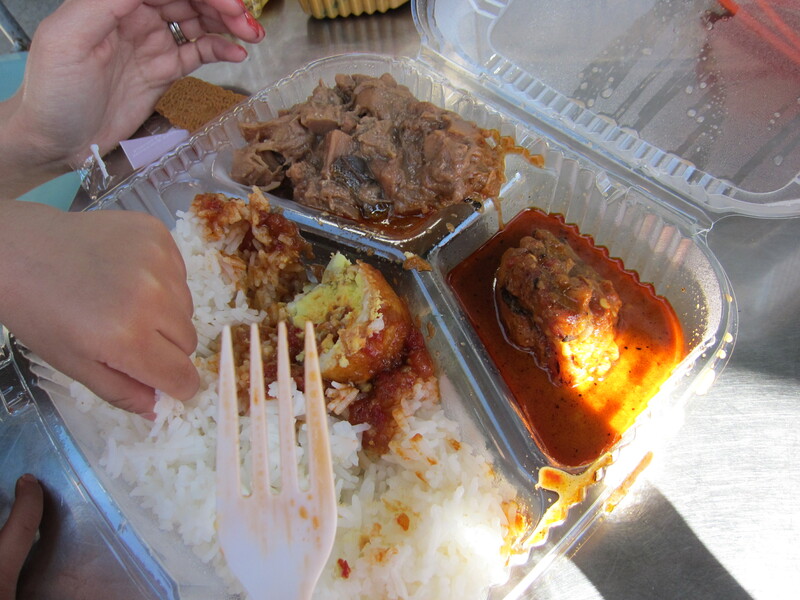 They had one stall selling Indonesian food manned by Borobudur restaurant in San Francisco. I was pleasantly surprised by their jack fruit, the brown thing you see above on the left. It looked and had the consistency of meat. A pretty good option for vegetarians. 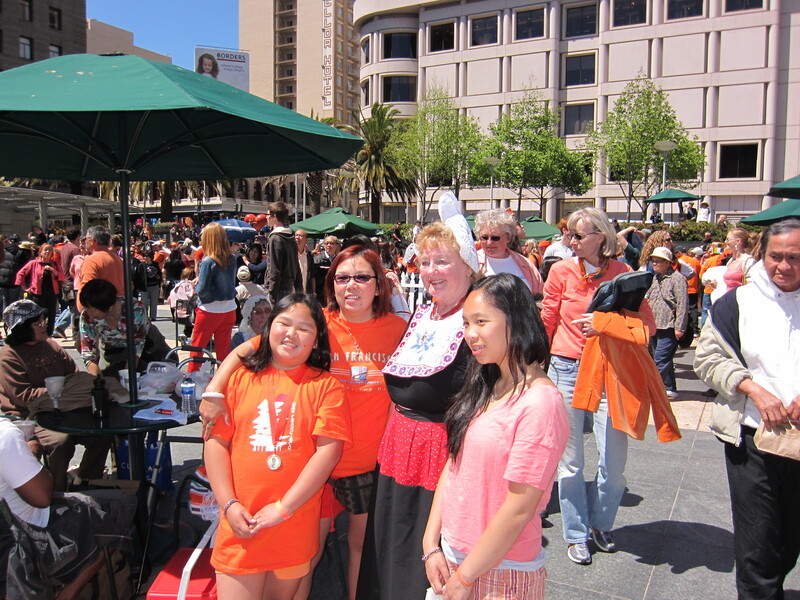 Other than that there was another stall selling Dutch pastries and sweets. They really need to investigate a way to get some bitterballen and frikandel for next year. They did pass out free coffee, courtesy of Peet’s Coffee (named after the Dutch man who founded the company) and cookies with speculoos spread. 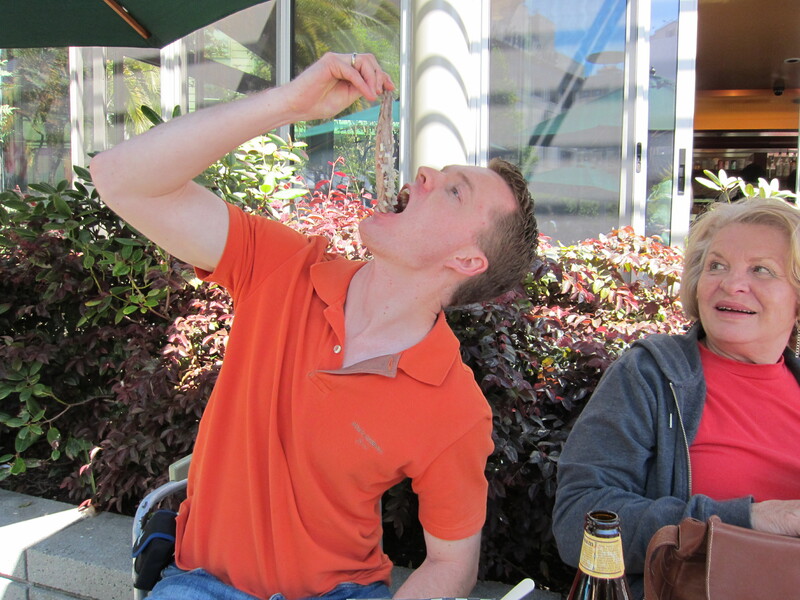 This is Hubby eating herring the Dutch way. Salted raw herring sprinkled with chopped onions. Lift it up by the tail, open up your mouth and slide it in. I keep hearing that it’s like sushi but really, it’s not. Give me sushi any day. 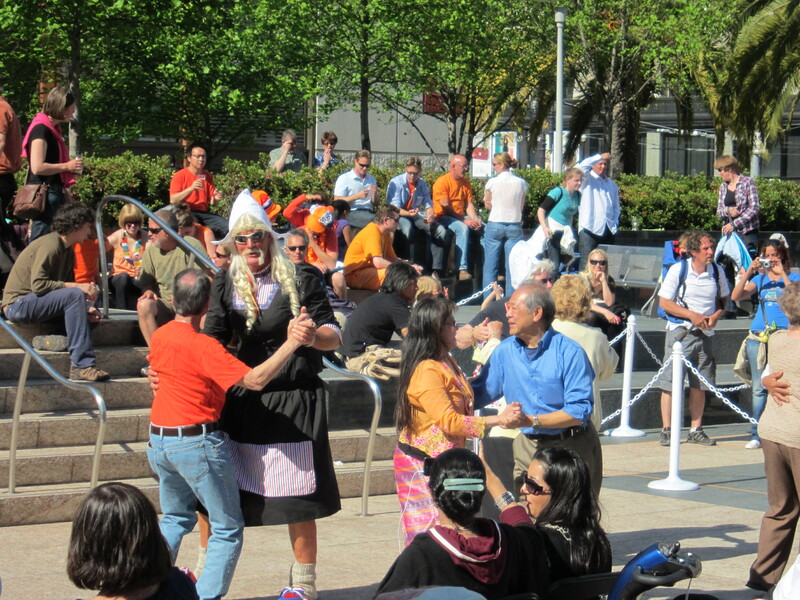 The crowd really got a laugh from this big man, whom Hubby dubs the Dutch Hulk Hogan, dancing away with his fellow-man. Hours later we were at Azul Lounge for the party. Pretty good turnout as well but definitely smaller than the crowd last year at Apartment 24. 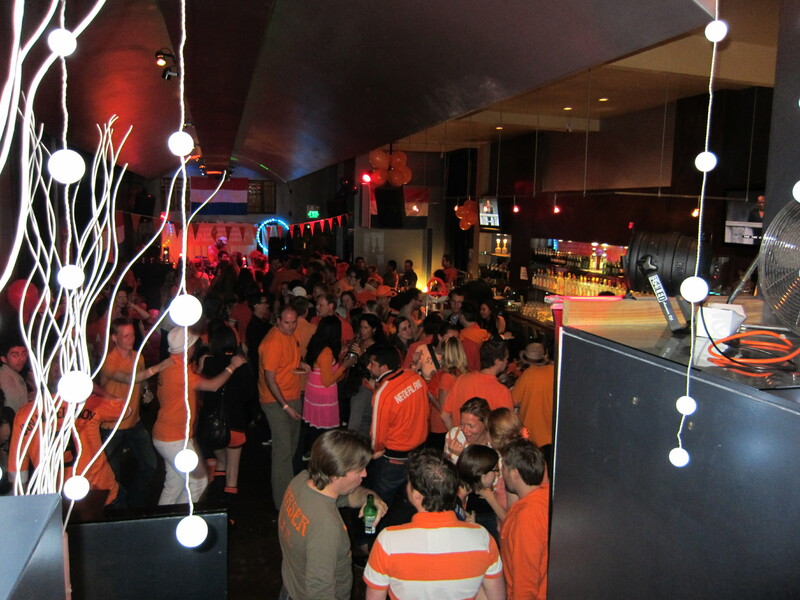 The orange shirt is back in the closet and will reemerge next Queen’s Day, where we may just be in Amsterdam for…. Yes can’t wait. Hope the weather is good!